This is the second book in series I have read. The first happened to be the first book in the series "Just Add Water"-You can read my review here if you missed it. I can honestly attest to the fact that these are stand alone books--This book is the seventh! And what a romp it was! I was somewhat reminded of Calamity Jane. Hetta and Jan are two women who don't give a fig-they will do what they want when they want and heaven help anyone standing in their way. Larcenous to the bottom of their hearts the thought of money and riches will make them attempt the unthinkable. They do also have hearts of gold--You will love Hetta's dog (who falls into an inter-species relationship!) 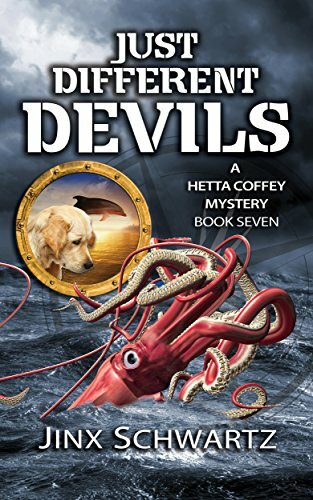 and even all the bad guys are in their own way lovable--but don't stand a chance against Hetta and her intrepid partner Jen! I found myself laughing out loud at parts of this novel--actually in more then a few instances!! It is a bit long-but WELL WORTH the read!! Hetta Coffey is a sassy Texan with a snazzy yacht, and she's not afraid to use it—most of the time. She's an intrepid cruiser, but wild rumors of marauding gangs of flesh-shredding giant Humboldt squid on a rampage in the Sea of Cortez could keep even Hetta tied to an expensive dock. However, when the opportunity for an intriguing and highly lucrative charter arises she talks her best friend, Jan, into signing on for a mysterious cruise. Damn the calamari! Full bank account ahead! I don't read a lot of fiction, but when I do it's either science fiction or mysteries. Never heard of this series, but since this is #7 it seems I have some catching up to do! This sounds like a fun interesting what will they do next read. It sounds like it would keep one captivated til the end. My list is long but so isn't Jan., Feb. and March so I'll add it. I love a good read, this looks like a super story line! Definitely going to find this. I love a good mystery. This sounds like a book I could curl up with for hours! I would like to read this book for sure. I like books that make me laugh and I like good mysteries. I love to read books that have a little humor to them. I can't wait to meet Hetta's dog! I adore strong female leads in books!! Sounds fantastic!! I'm not too sure about this one. Maybe I should read it and see if it will expand my genre preferences. Thanks for the review! This looks like a very interesting read. This is not the kind of story I usually read, but I like the part where the reader laughs out loud at what was read! A mystery and comedy in one story? To me, worth the read! This looks good! It seems very different from what I normally read. But I like to read outside of my box sometimes. I'm usually very pleased when I do!